Installing new radiators is a great way to improve the comfort and energy efficiency of your heating system, but much of your new radiator’s performance will come down to the radiator valves you choose. Radiator valves aren’t included when you buy a new radiator because there isn’t a one-size-fits-all solution; every home and lifestyle is unique so leaving them off means you can select the right type, size and style for you. However, this also means you may have a lot of choices to make! Don’t worry – we’ve gone through everything you need to know to get the best radiator valves for your home in this guide. Need new radiators or valves? What Does a Radiator Valve Do? Each radiator in your home needs a pair of radiator valves which act like taps, enabling you to control how much heat they give out. One of the valves controls the amount of hot water entering the radiator and the other (known as the lockshield valve) balances the system by controlling how much heat the radiator emits. The lockshield valve is usually covered with a plastic cap. It controls how much water stays in or flows out of the radiator and back into the pipework. It is usually fixed so you can’t easily turn it as the heating engineer will have set it up to ensure an even distribution of water evenly around the property, so your radiators will heat up at similar speeds. This is called balancing your radiators. There are 2 main types of radiator valves to choose from: manual or thermostatic. In addition, there are a growing number of companies now offering smart radiator valves. A manual valve is the most common type of radiator valve. You turn them either up, down or off depending on whether you want the room to be colder or warmer. Turning the valve adjusts the amount of hot water flowing through the radiator and therefore how much heat is emitted. Manual valves are the simplest to operate and tend to be smaller than thermostatic valves. The potential drawback with these valves is that you have to actively monitor them and remember to turn them off as keeping them on unnecessarily will waste both energy and money. 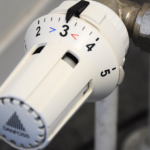 Thermostatic radiator valves (TRVs) can give you greater control over the temperature of your home as they are slightly more advanced than manual valves. You set the valve to the temperature you would like the room to be. The TRV includes some wax or liquid which can ‘sense’ the temperature in the room; when your desired temperature has been reached the TRV will shut off the flow of hot water and stop the radiator getting any hotter. This means that the radiators can manage themselves for most of the time and you won’t be spending unnecessary money on heating you don’t need. What Do the Numbers on Radiator Valves Mean? Radiator valves will have numbers or symbols representing how much heat the radiator is currently giving out represented by a level between 1 – 6. Generally speaking, turning the valve to number 3 should result in a room temperature of around 20°C with each number above / below representing a degree. So a 2 is around 16°C while a 4 is approximately 24°C. Manufacturers of radiator valves use this numbered system rather than exact temperatures as they can’t guarantee the temperature in the room; this will be affected by other factors such as the level of insulation in your home, if the radiator is by a window and how well your boiler is performing. It’s a good idea to pay attention to your radiator valve settings as you may not need maximum heat in all your rooms, e.g. you may prefer a cooler bedroom but a warmer bathroom. In addition, heating rooms which are rarely used such as spare bedrooms or utility rooms is also a waste of energy and therefore money. And when it comes to keeping heating bills low, remember that below 20°C reducing the temperature by a single degree can save as much as 6% in energy use. TRVs shouldn’t be installed in rooms with a wall mounted thermostat as both will be competing to try and control the temperature in the room. TRVs are not generally recommended in bathrooms or shower rooms because the TRV will be confused by the extra heat from the shower or bath and shut the radiator off when actually the radiator should remain on to reduce condensation. While TRVs can self-regulate most of the time they still need to be checked around once a year to ensure they are still working accurately. To ensure TRVs have the best chance to do their job and keep your heating system working effectively you should check that your heating system is balanced. This means ensuring the flow of hot water is evenly distributed around your home so radiators heat up at the same rate. If you have or are planning to have a smart thermostat to control your heating system you may come across the option of smart radiator valves from manufacturers such as Tado, Honeywell or Netatmo. A smart thermostat is connected to WiFi which enables you to control your heating via an app from a smart device. If the smart thermostat is compatible with smart TRVs, you can control each TRV in your home from your app from wherever you are in the world. Whether you opt for manual, thermostatic or smart radiator valves, before you buy you need to know if you need straight, angled, corner or H-block valves. Updating your central heating system? Find out how to get the best radiators in our Radiator Sizing Guide. Your radiator valves need to be compatible with the position of your radiator’s inlets and easily connect with the hot water pipes. Some pipes will come up out of the floor while others may come out of a wall. Finding the inlets on your radiator and pipes should be straightforward but if you’re not sure it’s best ask a professional. Send us an enquiry today and we’ll put you in touch with up to 3 reputable and fully qualified heating engineers who can advise you and provide tailored quotes for your home. Most UK radiators (such as a single or double panel convector or compact radiators) have bottom opposite end (sometimes called BOE) connections which means they come out either side of the radiator at the bottom horizontally. As pipework tends to come out of the wall, this usually means angled valves are needed to join the pipework to the radiator. More modern radiators may have middle connection valves (in the centre, at the bottom). This means you don’t have valves and pipework sticking out at the side so can be a great space saver. If a radiator needs to be connected to pipework coming up out of the floor and the radiator has inlets at the back (not the sides) straight valves may be a better choice. Straight Radiator Valves have no bends meaning your water will flow straight either along a wall or up from the floor. Angled Radiator Valves have a 90° bend which means it can connect the pipework with the radiator at an angle. They are the most common type of radiator valve in the UK and are a good choice for homes which have pipework coming out of the wall or up from the floor. Corner Radiator Valves are similar to angled valves but do not stick out from the bottom of a radiator as much; these valves are sometimes favoured in homes where space is restricted. However, they are installed facing inwards, parallel to the wall and so can be more fiddly to adjust. H-Block Radiator Valves are for radiators with middle connections rather than BOE. By installing a radiator with a connection in the middle rather than at both sides you are saving space. These valves can also be easier to install and replace. What Size of Radiator Valve Do I Need? The ‘size’ of radiator valve refers to the size of the connection and pipework rather than the size of the valve aesthetically. 15mm pipes are the most common and most valves are manufactured to fit this size, but you may come across pipework between 8mm – 28mm. If you do have smaller or bigger pipework than 15mm and are struggling to find the valves you want in the right size you can buy adapters to solve the problem. Once you’ve chosen the right type and size of valve for your home the last thing to consider is the look and style. There is a wide variety of styles available from simple, minimalist and contemporary to more traditional, elegant and classic options for period homes. How Much Do Radiator Valves Cost? You then need to consider the cost of installation. 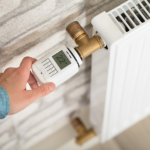 You will need a professional heating engineer to fit radiator valves as they will need to drain the radiator before the valve is fitted, ensure the valve and connectors are all safely secured and balance the heating system to ensure all radiators are heating at the the same rate. The cost of this labour will vary from engineer to engineer but generally you are looking at just under half a day’s work for one radiator with a full day needed for a complete system including around 10 radiators. On average costs could range from £100 – £350 but you’ll need to compare at least 2 quotes to make sure you’re getting the best deal. The type and size of radiator valve you choose will be influenced very heavily by your existing pipework and choice of radiator, but the style is down to your personal preference. To make sure you get the best radiators and valves for your home we recommend you contact a professional heating engineer who can assess your home and lifestyle. Send us a quick enquiry today and get free, no obligation quotes to compare.